Blaine is the Chair of Hayden Grant’s Litigation and Dispute Resolution Practice Group. For over 20 years, he has concentrated his trial practice on complex business and commercial litigation and dispute resolution before state and federal trial and appellate courts, as well as arbitration forums. He advises and counsels his corporate and individual clients pre-litigation and, when necessary, aggressively prosecutes and defends matters on behalf of his clients. Blaine applies a common sense and practical approach to his cases. He has unique case insight with work experience ranging as broadly as a small plaintiff's firm to mid-and large-sized firms, as well as state and federal prosecutorial experience. Blaine is proud of his designation by the judges he has been in front of, as well as opposing counsel, as an AV® Preeminent™ rated lawyer by Martindale-Hubbell, which is the highest possible rating for both legal ability and ethical standards. 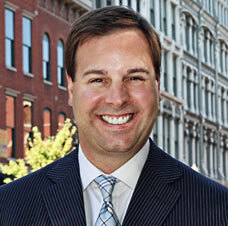 He is recognized as well by being listed in Louisville Magazine’s “Top Lawyers” issue in four separate areas: Business, Corporate and Commercial, Class Actions, Litigation, and Business Litigation, and in Kentucky's Legal Leaders™ "Top Rated Lawyers" issue in the area of Commercial Litigation. Blaine is also recognized by Thomson Reuters as a Kentucky Super Lawyer® in the areas of Business Litigation, Construction Litigation: Business, Estate & Trust Litigation, Professional Liability: Defense, Appellate, and Personal Injury - General: Defense, of which only up to five percent of the total lawyers in the Commonwealth are selected. He has also been selected for Fellowship in the prestigious Litigation Counsel of America™ and America's Most Honored Professionals, and nominated by the American Institute of Personal Injury Attorneys as one of the "10 Best" Personal Injury Attorneys in Kentucky. After graduating in the top of his law school class, Blaine has successfully litigated numerous multi-million dollar cases throughout Kentucky and the nation, including Ohio, Texas, Indiana, Tennessee, Missouri, Massachusetts, California, Florida, New York, Maryland, Michigan, New Jersey, Louisiana, Iowa, Illinois and Mexico. He has also taken 14 cases to jury trial, and handled numerous bench trials and evidentiary hearings. In addition, Blaine has argued several cases before the Supreme Court of Kentucky. Within Blaine's areas of concentration, he defends clients in class action matters, including the successful denial and outright dismissal of several multi-million dollar class action cases, as well as a nationally recognized case of first impression allowing the removal of an action to federal court under the Class Action Fairness Act. He also defends clients in defamation and invasion of privacy matters, and definitively established in Kentucky that an affidavit which contradicts prior deposition testimony cannot be used to defeat a motion for summary judgment. In addition, Blaine defends insurance agents and brokers regarding alleged errors or omissions claims and other issues, including arguing the propriety of an assignment of a claim against an insurance agent and broker before the Supreme Court of Kentucky, and authoring a chapter on the issue in a book recently published by Thomson Reuters. Finally, as a general business litigator, Blaine handles and successfully resolves a wide variety of day-to-day, as well as substantial, business problems, issues, disputes and claims, including contract, dram shop, professional liability, shipping and air carrier, bankruptcy, property tax, foreclosure, consumer, construction, warranty, trade secret, covenant not to compete, non-solicitation, non-disclosure, real estate, estate, negligence, tort, fraud, shareholder, products liability and other complex business and commercial litigation matters. All of these areas are described more fully in the below Representative Experience. Engaged in full-time law practice for over 20 years. Litigated cases in state and federal trial and appellate courts, and in mediation and arbitration throughout Kentucky and the nation. Successfully prosecuted 14 jury trials, as well as numerous bench trials and evidentiary hearings. Represented one of the largest privately owned aggregate suppliers in the denial of a motion for class certification brought by commercial and residential class members alleging over $50,000,000 in damages, as well as the subsequent defense and coordination of over 200 individual state court lawsuits filed in response to the class certification denial. The first eleven trial cases were settled at a very favorable amount at the eve of trial and after extensive fact and expert discovery, as well as extensive dispositive and pretrial motions and Daubert evidentiary hearings. Eventually, all of the cases (except for opt-outs) were resolved via class settlement. Also, subsequently enforced the Final Order and Bar Order against a class member in the trial and appellate court levels. Represented a publicly traded chemical manufacturer in an alleged multi-million dollar particulate and odor consumer class action matter. Serving as first chair, obtained a dismissal of a consumer class action matter against a national tax resolution firm at both the arbitration and federal court level. Represented a national bank in class action litigation brought on behalf of consumers challenging certain end of lease procedures and fees. The case resulted in a favorable settlement. Represented a venture capital firm in a securities class action matter that resulted in a favorable settlement. Also, subsequently enforced the Final Order and Bar Order against a class member. Represented a debtor in a Chapter 11 Bankruptcy challenging a $30,000,000 plus coal transaction. In addition, represented the debtor in the various avoidance actions within that proceeding. All matters were resolved on favorable terms. Serving as first chair, successfully represented an individual in numerous multi-jurisdictional cases involving millions of dollars in personal guaranties prior to and leading up to the filing of a Chapter 7 Bankruptcy. Serving as first chair, represented a spouse of the debtor involving his multi-million dollar Chapter 7 bankruptcy proceeding and resolved the matter on very favorable terms after extensive discovery. Provided adversary proceeding litigation assistance in the form of hearing attendance, oral argument, discovery, legal briefing, and case and trial preparation. Represented a global entertainment company, a national retailer of home improvement and construction products and services, and a national department store in a multi-million dollar copyright matter, and obtained a dismissal with prejudice prior to any discovery. Represented a machine manufacturer in trade secret/misappropriation litigation involving design drawings. After extensive fact and expert discovery, as well as extensive Daubert evidentiary hearings, the case was resolved with a very favorable settlement. Represented a publicly traded automotive after market distributor in a copyright, trademark infringement, and breach of fiduciary duty case involving its parts catalogs. Pre-litigation, and while serving as first chair, successfully forced a laser hair removal competitor to transfer back the client’s improperly obtained domain name. Successfully represented several companies in enforcing their covenant not to compete, non-solicitation and non-disclosure agreements. Successfully represented a publicly traded and national insurance broker in a number of insurance procurement matters, including a matter that I argued before the Supreme Court of Kentucky. Serving as first chair, successfully represented an equipment manufacturer in its capacity as a beneficiary to a multi-million dollar key man life insurance policy. After extensive discovery, the matter was resolved with a very favorable settlement. Serving as first chair, successfully represented insurance agents in numerous cases involving alleged negligent failure to procure proper insurance. Serving as first chair, successfully represented an employer-insured international bedding company against its insurance agents, third-party administrator and purported insurer in a stop-loss insurance scheme involving an employee benefit plan. Represented an elderly woman in a multi-million dollar action against her investment advisor and attorney. The matter was resolved on very favorable terms. Serving as first chair, represented a Texas manufacturer of high performance aircraft engines in a multi-million dollar contract dispute and successfully resolved the matter by having the foreign litigation transferred to the client's home state. Represented a publicly traded automotive manufacturer in various multi-million dollar contractual and lease disputes, and other matters, as well as assisted in overseeing internal and outside investigations. Represented a manufacturer of commercial air-conditioning and air-filtration products in a shipping matter and obtained a state court summary judgment on both liability and damages in favor of the client. Serving as first chair, represented a motorhome manufacturer in a consumer breach of warranty claim. The matter was successfully resolved just prior to trial. Represented a steel manufacturer in breach of warranty matters and other contractual matters, and resolved them all on favorable terms. Serving as first chair, represented a pharmacy in defense of and in prosecution of a substantial breach of contract action against its supplier and resolved it on very favorable terms. Serving as first chair, successfully represented a regional airline in a multi-million dollar breach of contract action. Serving as first chair, represented a residential home builder in a matter involving the enforcement of a restrictive covenant and resolved the matter on favorable terms. Serving as first chair, represented a restaurant owner in a dispute against a former minority owner and resolved the matter before litigation was filed. Serving as first chair, represented a distributor of construction and mining equipment in several breach of contract actions and resolved them all on very favorable terms. Serving as first chair, represented a leading international banking group in a contractual letter of credit matter and obtained a dismissal prior to any discovery. Serving as first chair, represented a full service event company in a contractual matter involving the Kentucky World Equestrian Games and resolved the matter on favorable terms. Serving as first chair, obtained a dismissal with prejudice of a business contractual matter involving the sale of tractor-trailer trucks prior to any discovery. Serving as first chair, represented a leading radiology service provider in a breach of contract matter and resolved the matter on very favorble terms. Serving as first chair, succesesfully represented a regional cable company in a substantal arbitration matter against its service provider. Represented a regional construction contractor in a week long jury trial for breach of contract, and obtained a jury verdict for the entire amount at issue. Serving as first chair, successfully represented a surety bond agency in an employment contract dispute. Serving as first chair, represented a worldwide producer of industrial chemicals in a wrongful death action, and obtained a dismissal with prejudice prior to discovery. Serving as first chair, represented a worldwide distributor of aircraft ground support equipment in a brain injury matter and resolved it on favorable terms. Serving as first chair, represented one of the largest gasoline-convenience store companies in a substantial brain injury matter. The matter was resolved the weekend prior to the trial on very favorable terms to the client. Serving as first chair, represented a landmark hotel in a substantial tort action. The matter was resolved just before trial on favorable terms. Represented a hospital public relations manager in a tort dispute arising during union negotiations and campaigning, and obtained a summary judgment dismissal of the claims after extensive discovery. Also, established law in Kentucky that an affidavit which contradicts prior deposition testimony cannot be used to defeat a motion for summary judgment. Represented both manufacturers and premises owners in cases involving asbestosis, lung cancer, mesothelioma, and silicosis. Serving as first chair, successfully represented a local County Board in a property trespass matter. Serving as first chair, represented the largest privately owned aggregate supplier in a motorcycle wrongful death matter. Serving as first chair, represented two individuals in a purported business fraud matter and obtained a dismissal of the matter prior to any discovery. Serving as first chair, successfully represented a regional website developer in an alleged fraud and breach of contract matter. Successfully represented one of the world’s leading financial management and advisory companies, as well as its employees, in several FINRA (formerly NASD) arbitration proceedings. Represented one of the nation’s leading banks in a RICO matter, and successfully obtained a summary judgment dismissal of the matter. Serving as first chair, represented one of the nation's largest independent broker/dealers in compelling a FINRA arbitration proceeding. Serving as first chair, represented an entity in a securities fraud matter involving oil and gas leases that was resolved on very favorable terms. Serving as first chair, successfully represented a thoroughbread industry entity in a shareholder derivative suit and receiver action. Represented an Estate and the decedent’s children in challenging certain realty and personal property contractual transactions on mental capacity and undue influence grounds. The matter was successfully resolved prior to having to initiate suit. Serving as first chair, represented a creditor in a multi-million dollar Estate proceeding and resolved it on very favorable terms. Serving as first chair, represented one of the nation’s largest investors to State and local taxing authorities in property foreclosure and other related litigation and appellate matters, including a matter that I argued before the Supreme Court of Kentucky. Serving as first chair, represented a large manager of property foreclosure matters in related litigation and resolved the matter on very favorable terms. Serving as first chair, defended a trust in a property foreclosure matter, precluded the foreclosure and reached a very favorable resolution for the trust.